One of the things Jude Quintero ’20 enjoys most about his Randolph experience is getting to know and work with his professors. This summer, he and mathematics professor Michael Penn are bonding over some advanced algebraic equations. Quintero and Penn are conducting a Summer Research project called Finite Group Invariants of the Rank 2 Heisenberg Vertex Algebra. Penn explained that invariants are a common theme in mathematics, and they are specifically researching invariants in the reflections and rotations of a triangle. Penn said these algebraic structures are called vertex operator algebras, and examples are currently hard to find. Quintero, an engineering physics major, is just a rising sophomore at Randolph but has already logged lots of time in the College’s research labs. He grew up five minutes down the road from Randolph and began taking physics classes at the College as a high school junior. 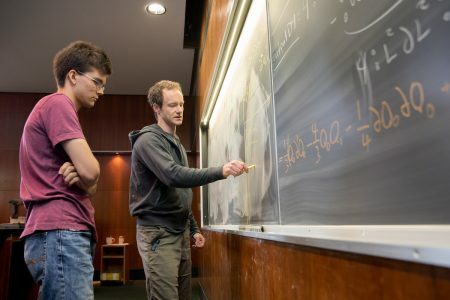 Quintero and Penn have completed all of their equations for rotations and reflections and the invariants they produce and are now writing a paper with examples. For Penn, that might be the hardest part. “To paraphrase what a famous mathematician once said, writing up a math paper is the punishment for all the joy you had when you were doing all of the problem-solving and exploration,” Penn laughed.